A butane torch over the years has undergone many changes and today they are advanced than ever. However, some people have described the use of kitchen torch adding an annoying butane taste to the food, but, this is still a debated subject. If you are planning to purchase a kitchen torch, then you should prefer considering these factors. These factors will help you select and purchase the best kitchen torch. These are the only key factors you should focus while purchasing a kitchen torch. Design – A kitchen torch can come in various designs and with various attractive features. However, this directly or indirectly affects the efficiency of the tool. To enjoy the maximum efficiency of the kitchen torch, the product should come in an ergonomic design. So, what exactly does ergonomically designed kitchen torch mean? You would surely know what an ergonomic design, in the beginning, kitchen torches came in poor design often resulting in burns and discomfort. They usually led to accidents. But, eventually the kitchen torches have undergone many changes and today, they are as advanced as they can be. They come with excellent grip, in a size that can fit in your palm, ridged handles, and insulated body to ensure they don’t burn your hands. So, while purchasing a kitchen torch consider the above-mentioned features. Type of gas used – Type of gas or the gas is perhaps the sole of a kitchen torch. I probably don’t have to explain why. However, there are three types of gases that can be used in a kitchen torch. PS: there is no difference in the functioning, but, some customers reviewed that the end result might have some negligible difference. The only thing you should consider while choosing a gas is that it should be readily available in your locality. Currently, most of the reviews indicate that butane refills are more abundantly available than other gas refills. Capacity – A kitchen torch comes with different capacity. But, some brand offers products with comparatively higher capacity. One of the key advantages of larger capacity kitchen torch is that it can help you avoid frequent refills. Some manufacturers also provide free refills with their product and this will conveniently help you save some bucks. Durability – In the beginning of this section, I explained about the factor ergonomic design. Apart from being ergonomic, a kitchen torch should be durable. This simply means that the device should not explode or burn your hands under any circumstances. So, while purchasing a kitchen torch consider purchasing a one with durability. Size and strength of the flame – Size and strength of the flame is the key factor to be considered while purchasing a kitchen torch. As the size of the flame and strength of the flame increases the efficiency of kitchen torch increases, however, with this being told, remember that larger flame size and higher flame strength means that more gas is burnt during this process which, in turn, results in frequent refilling. Any kitchen torch you buy should come with an option that enables you to change the strength and size of the flame. Easy on/off – Kitchen torch comes with different types of on/off functions and this depends entirely on the model and brand. Some models come with instant ignition trigger or pressing a button will simply ignite the torch. However, some other models will demand the user to constantly depress the trigger when lit to sustain the flame. But, I recommend the kitchen torches which comes with a button that simply ignite and sustain the flame until we switch off the button that eventually kills the flame. Self-contained vs. attached to fuel tank – A kitchen torch come in two types. Self-contained, the ones that come refillable fuel chamber. The other type torches are those designed to be simply screwed to the fuel canister. So, purchase a kitchen torch that you find suitable for your purpose. Here is the list of best kitchen torch available on the market right now. Do you want to level up your cooking skills and surprise everyone at your next dinner in an effective and stress-free way? 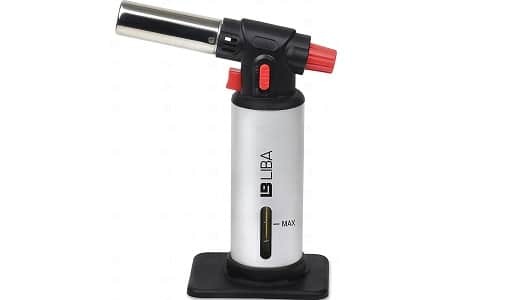 JB Chef Culinary Micro Butane Torch is a handy gadget for you. Forget all the traditional culinary torches which stop working after some time. This wonderfully designed food torch is made of top quality materials and it has locking system to cook safely and easily. No matter you are a cooking lover or a beginner, you can make everything in style with this kitchen utensil. It is the best choice for different deli preparations and foods. Brown sweet pies and meringues with it, toast bread crumbs, melt cheese and make crisp toppings, and roast bell peppers. Used in some of the best restaurants, LiBa Culinary Torch is best to caramelize with sugar over Crème Brulee, sear a steak, glaze baked ham, melt cheese, roast bell peppers, and toast your bread crumbs. It has safety lock and anti-flare technology for added safety. For convenience, simply slide the lock to off, turn the knob until you hear the flow of gas and press ignition button. The flame can easily and quickly burn to 2730 degrees. 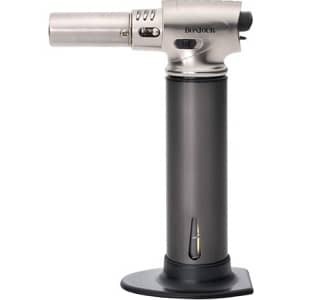 Iwatani Pro2 Butane Torch is an ideal kitchen tool for you whether you sear well-cooked steak, create delicious sugary crust on your desserts, charring and roasting vegetables, or making more for kids. It is easy and quick to use with adjustable shape and flame size to focus on the right flame for your food. It features piezo 1-touch ignition designed for easy and fast start up. It has safety plate so butane torch will not topple over and wreck havoc on your floor or countertops. 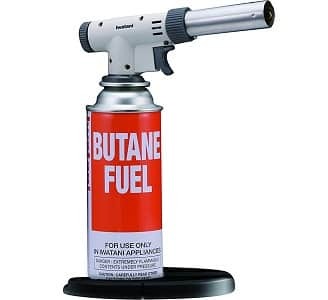 You can easily replace its butane canister to never run out of butane. Simply twist it and lock it. Perfect for charring and roasting veggies, browning toppings, glazing ham, etc. This culinary torch made of metal body can easily turn a casual home cook into a professional chef. 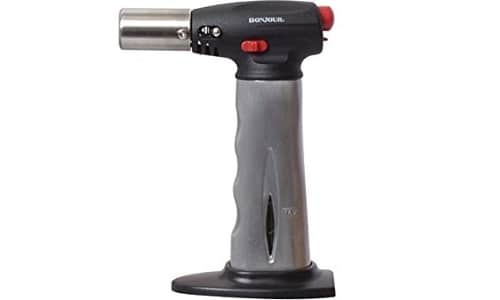 BonJour Chef’s Tools professional culinary torch is ideal for caramelizing sugar, crème brulee, melting cheese, meringues, skinning tomatoes, crisping meats, charring veggies and peppers. The torch is powered by butane gas and has fuel level indication window. It also has temperature control, anti-flare flame with extra-long nozzle, removable stand and safety lock. 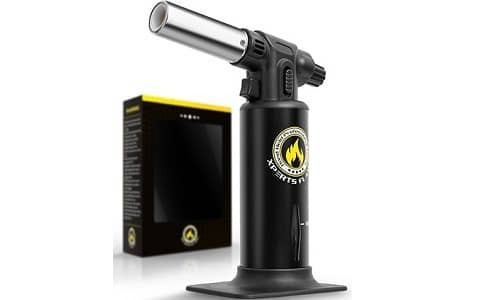 Blazere GB2001 refillable butane micro torch is time tested to create flame from nozzle head and allows application of direct heat to any object. It is widely used for detailed purposes, including plumbing, brazing, jewelry making, soldering, culinary, dental and automotive applications. It has diamond-shaped, rubber body finish for ease of use and safe grip. It has a lever to adjust the gas flow for ease of precision and flame heat change. The torch flame is easy to adjust from yellow to hot blue. The torch has removable table stand. Unlike other micro touch products, it provides long burn duration. Tabletop stand that allows you to use single-handedly. Keep your family and guests surprised with exquisite restaurant-worthy touch to your dishes by using XPERT’s FLAME culinary kitchen torch. Give the ultimate glaze, shine and charred look to the dishes to impress your guests. Roast the bread crumbs before offering the soup, melt the cheese over desserts or sugar over starters or sear meat for fiery flavor. 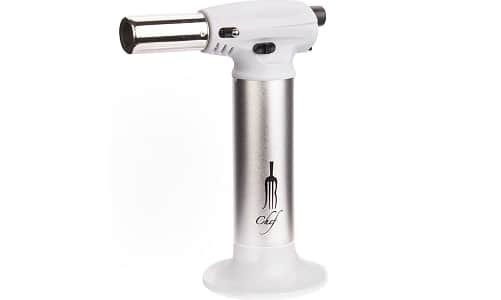 BonJour Chef’s Butane Culinary kitchen torch is your best choice to make restaurant grade desserts to serve different purposes, such as browning meringue, caramelizing sugar, and melting cheese. You can easily charge it up with butane fuel containers. It is made of durable die cast aluminum. The torch has window to show fuel level so you will know when to refill it. It is a handy gift for a kitchen lover. Using a kitchen torch might seem very simple but it is not as easy as you think. Yes, it’s not easy, clicking a button to ignite is easy, but, using this flame needs experience. I recently found out that there is a technique in order to efficiently use the flame to perfectly cook the food. The key to utilizing the torch efficiently is by making sure that the flame obtained is an oxidizing flame, which simply means that the tip of the flame should be blue. A flame with blue tip simply means that the temperature is just right for the cooking and that your flame is not on too high to burn your food. Recently, I also happen to notice a lot of kitchen torch user who directly turns on/ignites the torch in front of the food. To be frank, this is how I used to do and thought it doesn’t really matter. But, just a few days ago, I realized the fact that by igniting the torch in front of the food might lead the fuel to accidentally get transferred resulting in bad taste and sometimes accidents. While using a kitchen torch always keep in mind to control the flame in such a way that its optimum enough to not burn the food. If you are a person interested in cooking exotic dishes, a kitchen torch is a must have kitchen tool. All the products mentioned above come from top reputed brands and all the products are top rated. Hope this article helped you to find the best one. Don’t forget to share your opinion in the comment box. Have a good day!